People use savings accounts for the wrong thing, and it hurts them. Every bank I’ve seen has savings accounts, and they all come with snazzy logos and slogans like “Watch your savings grow with HSBC!” or “It all starts with saving today” or whatever. The banks pretty much say that if you sock money away into savings accounts, you’ll be rich somewhere down the line. The problem is that it isn’t true. Far from being get-rich quick schemes, savings accounts, used badly, are basically guaranteed to help you get poor slowly. A savings account is a really safe bet. It’s one of the few places where you can store money and be legally guaranteed to get it all back at the end. The only problem is that the money from the savings account isn’t worth as much when you get it back. Wait, what? That doesn’t make any sense at all! If you got all the money back, how is it less valuable? Because inflation–the tendency of prices to rise over time–means that the buying power of your money fades away unless it grows faster than prices are going up. Unless your savings account reliably pays a higher-than-inflation interest rate, which almost none of them do, you’re losing money over time. That’s a problem if you’re thinking of a savings account as a way to grow your money. 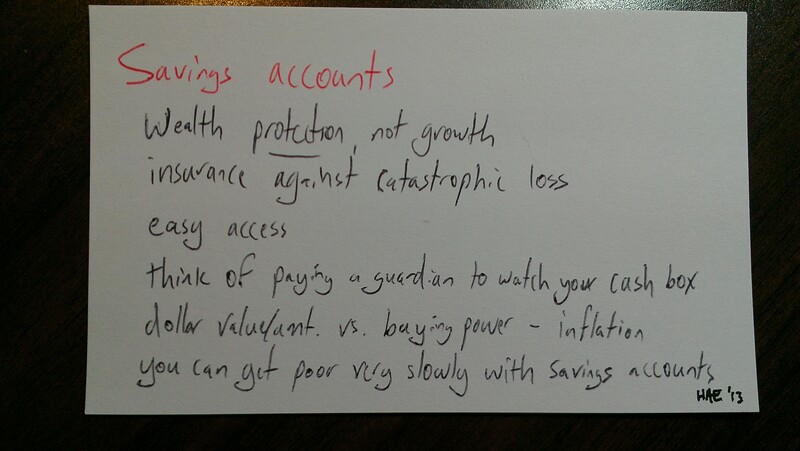 I’d like to encourage you to think about savings accounts differently. They have a place, but they aren’t about growing your wealth. Savings accounts are for protecting money you might need to access quickly someday, not getting more money. Think of your savings account as an insurance policy, not an investment, and you’ll be on solid ground. Are your eyes glazing over? Don’t worry! People use lots of abstract words to talk about money, and I think it confuses things and makes normal people throw their hands up and just continue making poor choices because it all feels too complex and hard to understand. So I’m going to try to use plain English as much as possible, with concrete examples and drawings on index cards! Savings accounts mostly don’t grow in value over time. I want to be able to talk about a couple of concepts here, so let’s define some terms. Value is a measure of what I can do with some money: if I want to buy a new set of bagpipes or have someone repair my furnace, I need enough value that someone is willing to trade their stuff for my value. Dollars are units of US currency. They’re related to value, but they aren’t the same, because a given number of dollars won’t always buy you the same amount of stuff. Think about how Red Sox tickets cost a lot more during the World Series than during pre-season, or about how gas used to cost $0.85 per gallon and now costs $3.92. Inflation is a name for the observed trend that, as time passes, you need more dollars in order to reach a certain amount of value. When I bought my first cup of coffee, it was less than a dollar; now, a cup of coffee from the same store costs $2.25. That’s inflation. Back at the top of this section, I said that savings accounts mostly don’t grow in value over time. What I mean is that although the number of dollars in your savings account will grow over time, it won’t grow as fast as inflation, and that means that the value of your money–what you can do with it–tends to shrink over time. If you’re bored by numbers, skip this section. Otherwise, read on. You can look up historical US inflation rates at the Bureau of Labor Statistics’s Inflation Calculator and use it to calculate annual inflation. What they call “buying power” is what I’m calling value. I’ll go year by year, since that makes the inflation easier to see and ties nicely into the discussion about interest rates that we’re going to have in a moment. Imagine that you’ve taken $1000, stuck it under a mattress, then come back the next year to buy something with it. Unfortunately, all the prices are higher now. 2007: You’d need $1028.48 to buy what used to cost $1000. (2.84% inflation). 2008: You’d need $1038.40 to buy what used to cost $1000. (3.84% inflation). 2009: You’d need $996.44 to buy what used to cost $1000. (-0.36% inflation). This was the big crash year. 2010: You’d need $1016.40 to buy what used to cost $1000. (1.64% inflation). 2011: You’d need $1031.57 to buy what used to cost $1000. (3.16% inflation). 2012: You’d need $1020.69 to buy what used to cost $1000. (2.07% inflation). 2013: You’d need $1019.84 to buy what used to cost $1000. (1.98% inflation). That’s what I mean when I say your money loses value over time. Unless your number of dollars grows faster than inflation, your money buys less later on. You’ll notice that all the banks offer way less interest than what it would take to beat inflation. Some of them are just ridiculous! The best of the ones I listed (Capital One 360 Savings) would earn you $7.50 on your $1000 savings in one year, which means you lose $12.34 in value because of inflation. The worst of them (First Niagara Statement Savings) will pay you a whopping ten cents on your $1000. At that rate, if you wanted to buy yourself a cup of Starbucks coffee ($2.75) with your annual interest earnings, you’d have to put $27,500 in the bank for a year! Turning back to inflation, the bigger problem is that your $1000 is now worth a lot less. Remember that you need $1019.84 in 2013 to buy what $1000 would have bought in 2012. So even if you’ve got that sweet Capital One 360 account, you still only have $1007.50 and you need $1019.84, so you’ve got to come up with that extra $12.34 out of your pocket if you want to buy something. And we aren’t even talking about taxes on the interest yet! Interest rates are marketing and advertising tools designed to convince you to lend your money (they’ll call it ‘deposit’ or ‘save’) to a particular bank. The banks can have lots of reasons for wanting to do that, but basically it comes down to cash flow: they’ll take your money, lend it to other people, invest it to make more money, or hold onto it to secure their own debts. They’ll pay you a little bit (the interest) for letting them hang onto your money, but unless they’re paying you a rate higher than inflation, your money isn’t growing. 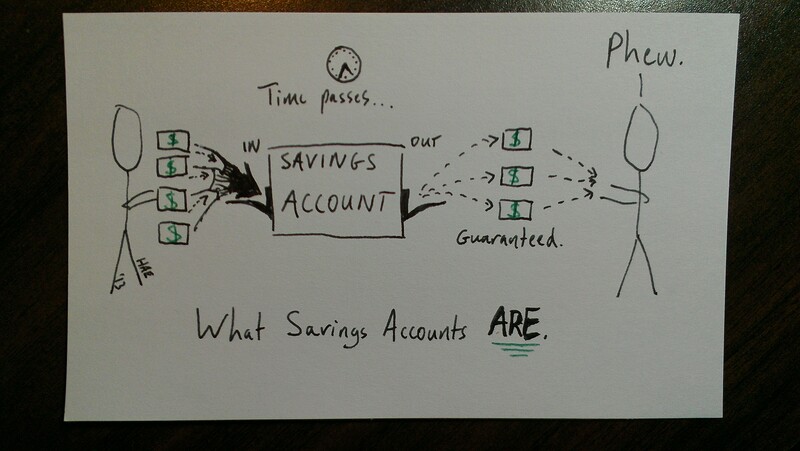 I’ve been talking a lot about how savings accounts are unhelpful for making your money grow, and you might be wondering: “what’s the point of having a savings account at all?”. Savings accounts are great tools for making sure that you have access to your money, immediately, whenever you need it. In financial terms, they have very high security (your money is guaranteed to be there) and liquidity (you can have it immediately just by asking). Savings accounts are for your emergency fund: the money you’ll need immediately if you lose your job, your house has a catastrophe, or someone in your family has an accident and needs immediately medical care. When these things happen, you need the money to be there, and you need it to be there Right Now. You don’t want to keep the money in your house: someone could break in and steal it, or your house could burn down, or a tornado might carry it away. 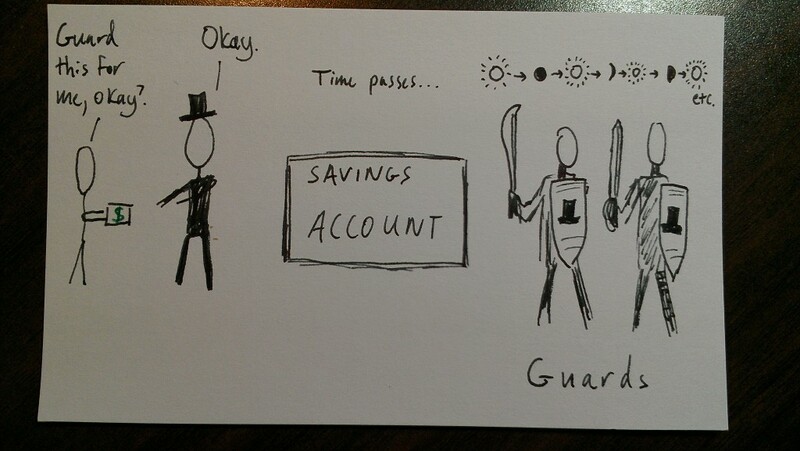 You want something more secure, so you decide to hire some guards to look after your emergency fund. You head down to Top Hat National Bank and make an agreement with the banker: he agrees to protect your money 24/7, guaranteeing that he will give it back to you whenever you ask. He takes your money and puts it in the savings account, which is guarded night and day by hulking Myrmidons in suits of armor. This is fantastic! Totally secure, and now your emergency fund is really safe. Mr Top Hat wants to be paid something for his efforts–all those guards want a paycheck too–but you’re happy to pay it because you value being able to trust that your money is safe and immediately available, forever. You feel even safer knowing that Mr Top Hat’s promises are backed by the full faith and credit of the US federal government thanks to FDIC and NCUSIF/NCUA–the insurance policies that banks and credit unions have to buy before they’re allowed to guard your money. So you choose the savings account because, even though its low interest rate means losing ground to inflation every year, the advantages outweigh the costs. You’re basically buying an insurance policy against catastrophic loss, and you’re paying for it by losing a little money to inflation. This has nothing to do with investing or growth. The purpose of the savings account is to protect a portion of your money so that it will always be there when you need it, no matter what. You’ve probably noticed that the only difference relates to your intentions. 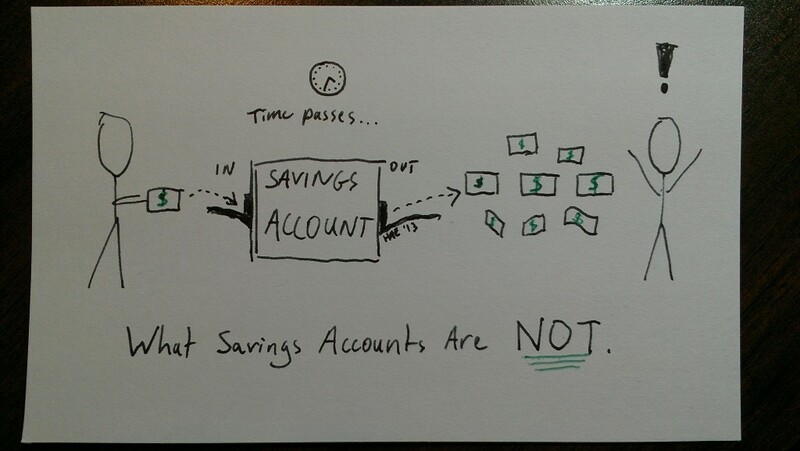 If you’re saving money because you want it to grow, you’re going to be disappointed by a savings account. You’re using the wrong tool for the job; you’ll need to look into investing in things like stocks or bonds if you want to end up with substantially more money than you started with. Inflation matters here. If you’re saving money because you want to protect it and make sure it’s there in an emergency, a savings account is an excellent choice. You’re willing to pay the Myrmidons to guard your cash, and the insurance they provide is valuable to you. This is a great way to secure your emergency fund. You don’t care about inflation here; you care about security. I’m not saying that you should stop using savings accounts–far from it! Some of your money should always be in savings, for the emergency fund we talked about. Folks differ about how much money they want to have in emergency funds, but most people say anywhere from two weeks to a year of living expenses. That’s money that you really can’t afford to lose, so it goes into a savings account. Once you’ve got that amount safely stocked away and guarded by the metaphorical Marines in Fort Top Hat, then it’s time to think about investing some of your money to make it grow. Savings accounts are the wrong route for this money–you need investment. Any questions? Please leave a comment! If this was helpful, please share it with your friends! Disclaimer: I’m thinking about systems here, and that leads to some hand-waving that’s a little confusing about who’s getting paid what. The bankers aren’t getting paid by inflation, exactly, so it’s not accurate to imply that the banks are getting rich directly because your money isn’t keeping pace with inflation. However, I’m in the metaphors business, and the guards needing to be paid is a much more useful metaphor than the degree to which the returns offered you by the bankers based on the investments they’re making with your lent capital are keeping up with rising consumer prices and losses to tax. The point here is that I’m trying to help you see savings accounts in a different light, which I hope this framing achieves. Also, I encourage you to read and think about this stuff on your own, but I am not a financial advisor and don’t know your situation, so I can’t guarantee any particular outcome for you. That should take care of the legal disclaimer fine print, eh? I use my savings account as a protection plan.. protecting it from MYSELF. It’s at a separate bank from all of my other accounts and I totally forget about it unless I need a down payment for a car or a visit from the roofer / electrician / etc. You’re absolutely right that interest rates are so terrible, you shouldn’t expect to make money from a savings account. I love the cards to explain your ideas. It’s fun to see the one with time passing by notated with suns and moons, that’s clever. Your thesis is very clear! I want a follow up of what TO DO for money to grow. I already have my own ideas, but I would guess that some of your readers would be interested. So…what do you recommend as investment vehicles? Andrew, more on that later, but in the meantime my short answer is: find a mutual fund with a very low expense ratio, broad exposure to the market (i.e., index fund), and no fees, and stick some money into it every month via automatic deposit. Make it automatic so you don’t have to think about it, and re-evaluate once a year. I’m a big fan of Vanguard, and I would recommend looking into their Total Stock Market Index (VTSMX). If you have specific goals in mind (retirement, general wealth, buying a house, etc. ), the answers might be different. Jasmine and I spend a LOT of time talking about this stuff, so we have fun with it. Really, my only quibble here is that Mr. Top Hat is the sort of name a railroad baron would have; Mr. Bowler is the sort of name a banker would have!